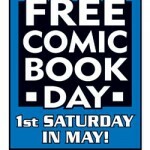 If you have been paying attention the past few weeks, you might have seen me mentioning Free Comic Book Day (FCBD) in the Tuesday Tidbits posts. Plus, yesterday, Bri wrote an excellent post explaining how FCBD works. Today, I’m going to go one step further. I have been grabbing information from every store I can think of, so I can let you all know which shops are doing more than just putting comics out on tables and letting people grab what they want. Many of these shops will be having sales, costumers and cosplayers, special guest creators, and even face painting to really help make this a great day. Before I start going into what shop is doing what, I would like to mention a few things. On Saturday, I’m planning on hitting a lot of shops. I mean, most stores in Indianapolis, plus Greenfield, Muncie, and maybe Anderson. Bri will be working at Downtown Comics North, helping with the books, so you’ll definitely be seeing Team Geeking around. Also, and I know it’s been mentioned a few times, please remember that some shops might have a book limit. Please respect that, as these shops have to pay for these books that they are giving you for free. Also, if you have some spare scratch, take a look at some of the items they have for sale. You can’t go wrong dropping a few dollars into your local Friendly Local Comic Shop, and also your local economy. Thanks to Trae Dorn in the comments for the info! 12 long boxes of FIFTY CENT back issues, including Spider-Man, X-Men, New 52, early Image, and more. Thanks to Mike Harrison for bringing this to my attention, and Shawn D. Hilton for the info! Note: They have not put anything out saying what is specifically happening at their three (Monument Circle, Castleton, West) locations. Your results may vary. Spend over $500, see what happens! I will continue to update this post through Friday night, in case I get any new information. Hopefully see many of you when I’m out and about on Saturday! Dang it, I’m going to get in big trouble if I have to keep going to Facebook for information when I’m at work. Could you do me a huge favor and email me the information at IndianaGeeking@gmail.com? Oof, didn’t see this until now. 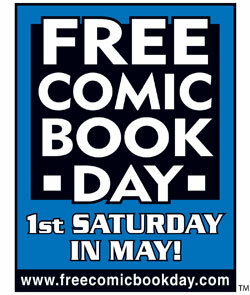 Free comic book day from 10am-6pm Sat. Nothing going on at Dee Puppy Comics or Collector’s Paradise? Figures; those are the closest to where I live. Guess I’ll be driving across town! I don’t know about Dee Puppy, as I keep hearing mixed signals about how active Fritz is any more, and I haven’t had a chance to track him down myself. Collector’s Paradise is at least giving away books, just nothing else going on there, that I’m aware of.